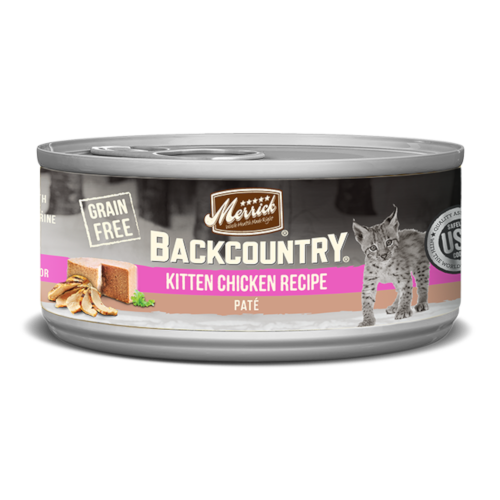 Merrick Backcountry Kitten Chicken Recipe Patés provides a meaty flavor for felines to feast upon plus the balanced nutrition and necessary moisture a kitten needs. Real deboned chicken is always the first ingredient. This high quality protein helps build and maintain healthy muscle tissue and energy levels. Complete and balanced nutrition that adds moisture and flavor to your cat’s diet. Specially formulated for growing kittens, this recipe contains DHA to support healthy brain development. All Merrick recipes are crafted in our Hereford, TX kitchen and cooked in the USA, in facilities that uphold strict FDA guidelines. Deboned Chicken, Chicken Broth, Chicken Liver, Pea Protein, Potato Protein, Natural Flavor, Dried Egg Product, Calcium Carbonate, Sodium Phosphate, Guar Gum, Potassium Chloride, Salt, Choline Chloride, Salmon Oil, Agar-Agar, Flaxseed, Locust Bean Gum, Xanthan Gum, Taurine, Minerals (Zinc Amino Acid Complex, Iron Amino Acid Complex, Manganese Amino Acid Complex, Copper Amino Acid Complex, Potassium Iodate, Cobalt Glucoheptonate, Sodium Selenite), Vitamins (Vitamin E Supplement, Vitamin B12 Supplement, d-Calcium Pantothenate, Vitamin A Supplement, Niacin, Vitamin D3 Supplement, Riboflavin Supplement, Folic Acid, Pyridoxine Hydrochloride, Biotin, Thiamine Mononitrate). Merrick Backcountry Grain Free Real Chicken Recipe Paté Cat Food is formulated to meet the nutritional levels established by the AAFCO Cat Food Nutrient Profiles for All Life Stages. *If an item has an *, this nutrient is not recognized as an essential nutrient by the AAFCO Cat Nutrient Profiles.